Wallace at the International Symposium for Novel Aromatics in Hong Kong. Nicolau and Jia Yi win the 3-minute thesis prize at the inaugural Melbourne University Chemical Society 3-minute thesis competition. Wallace and David were involved in a Melbourne University advertising campaign to highlight research across the university - Made Possible by Melbourne (https://pursuit.unimelb.edu.au/features/making-any-surface-solar). Bolong, James, David and Wallace published an accounts article in Accounts of Chemical Research (http://pubs.acs.org/doi/10.1021/acs.accounts.6b00432). Young scientist mentorship. PhD student, Quentin Hong, mentored an Elizabeth Blackburn Science School student, Christian Scaramozzino, through his VCE science research subject. Christian looked at the possibility of using fluorescent solar concentrators to extend the operation time of mobile devices. PhD student, Bolong Zhang, receives Andrew Kirby award for academic excellence in his MSc degree. Wallace discusses how energy is hidden in colours in this University of Melbourne Pursuit magazine article. Wallace will be joining the new Centre of Excellence for Exciton Sciences (ACEX) in 2017. 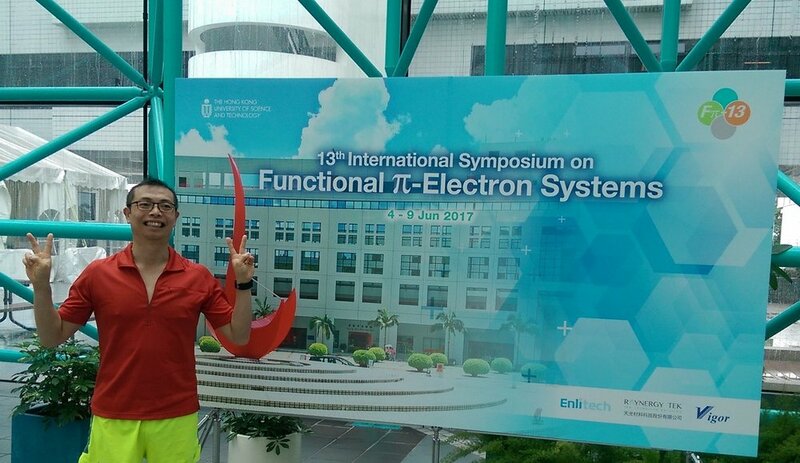 Wallace attended the International Conference on Synthetic Metals (ICSM) in Guangzhou, China from 26 June to 1st July 2016. Research on the use of emissive aggregates in luminescent solar concentrator devices was highlighted in SPIE news room. Wong/Jones group participated in workshop in January at UoM for the IRRTF Asian Research Network. Other participants include the Ultrafast Microspectroscopy group and academics from CSIRO, Shandong University, Changchun Institute of Applied Chemisty, Nanjing University of Posts and Telecommunications, IISc Bangalore and IIT Kanpur. Article on transparent conducting electrode materials in The Conversation. Wallace elected to the international advisory board of the International Symposium on Novel Aromatic Compounds (ISNA). The next ISNA will be in Stony Brook, New York, July 23-28, 2017. Wallace receives Dean's Award for Research Excellence 2015. TEM tomography image of an organic semiconducting thin film made the back cover of J. Mater. Chem. A.